Welcome to the Festival! Each fall and spring when we gather online to share quilts, I’m so inspired, and even more encouraged by this fantastic community of quilters! Thank you all for sharing your quilts, and their stories, for me each story is just as important, as the work put into the quilts. The story is where we get a sense of you, the maker, and the love put into each stitch. Please know that your skill level, or style of quilts are not in question – everyone is welcome to participate. Join in the fun! Make some new friends while you browse the show, and be inspired! First up, a big THANK YOU to our sponsors! They have generously donated prizes for all of you to win. Be sure to stop by their shops, browse our vendor mall, while taking in all the quilts. They love being the suppliers for all your fabric and sewing needs! Next, as you make your way through all the quilts, email me if you find a quilter that you think would make a great feature here (or your friend, that needs a boost!). I’m always looking for more Featured Quilters! Finally, be sure to leave a comment on this post, to be entered to win one of the fabulous giveaways. Good Luck! Burgundy Buttons is offering a $25.00 Gift Certificate to Burgundy Buttons so that you can pick your own must have! Canton Village Quilt Works is offering a fat quarter pack of all the in stock aboriginal dots! Fabricworm is offering a $25.00 Gift Certificate! Fat Quarter Shop is offering a $100.00 Gift Certificate! Green Fairy Quilts is offering two $25.00 Gift Certificates! I Have A Notion is offering a Beam & Read 6 LED Light -The personal, portable, hands free light for anywhere, anytime, that won’t disturb others. Excellent for all needlecrafts. The Quilting Garden is offering a Terrain fat quarter bundle! This n that Creations is offering five $10.00 Gift Certificates! Vicki Welsh is offering your choice of a beautiful Stash Pack available here! Candied Fabrics is offering a Versatile Messenger Bag Pattern! This is a detailed pattern for 2 sizes of messenger bags, with 25 full color figures to illustrate each step, this pattern will guide you through creating your own unique bag! Old Red Barn Company is offering a $50.00 Gift Certificate! Prairie Moon Quilts is offering a kit for the newest Cowboy Christmas Stocking, a packet of 4 western fat quarters, and a copy of “Prairie Moons & Stars” pattern! Swell Cloth is offering a Echino fat quarter bundle! The Quilted Fish is offering a $50.00 Gift Certificate! Wondrous Woven Fabrics is offering a Heirloom fat quarter bundle in the ruby colorway! Add your post to the linky, and leave a comment to be entered to win! The red X is only seen on your computer, it gives you the option to edit/delete your link if necessary. Pull up a comfy chair and enjoy the show! If you have a question, please email me directly, as questions in the comments will not be answered quickly, I will do my best to help. Oooh yay, I love Bloggers Quilt Festival time, can’t wait for the linky to start getting filled up with gorgeous quilts to read about!! Thank you again, Amy, for hosting this wonderful virtual quilt show! I always look forward to the festival and to seeing all the beautiful quilt from all around the world! Thank you Amy!!! I’m really excited to join in the fun this time round, I’ve got a little bit of pottering around and cleaning but the afternoon is free to sit and have a read and get some much needed inspiration! Thanks for hosting another Festival and all the work you put into it every time! It sure is a lot of fun for all of us who participate, and the others. I have linked up and hope to start viewing the show this evening. Delighted to be part of the festival again! There is always so much eye candy and inspiration here and I always make new friends. Thanks Amy! I’m so excited to be participating this time! Thank you so much, Amy for all the work you do for this Festival! I can’t wait to browse through all the amazing quilts and hear their stories! Thanks , Amy, for this wonderful way to share so many quilts. I love it each time the festival comes around. I am looking forward to seeing all the quilts!! Thank you so much again for hosting the Quilt Festival. I really look forward to your festivals. It’s fun to see all the beautiful quilts. Thank you also to the wonderful sponsors!! There’s some wonderful quilts here! It’s just so interesting to see so many lovely quilts in such a variety of designs and colours. Thanks for organising this! Amy, Thank you so much for hosting this event again, it’s a pleasure to browse through all of the quilts on show and see all of the variety and inspiration on offer! 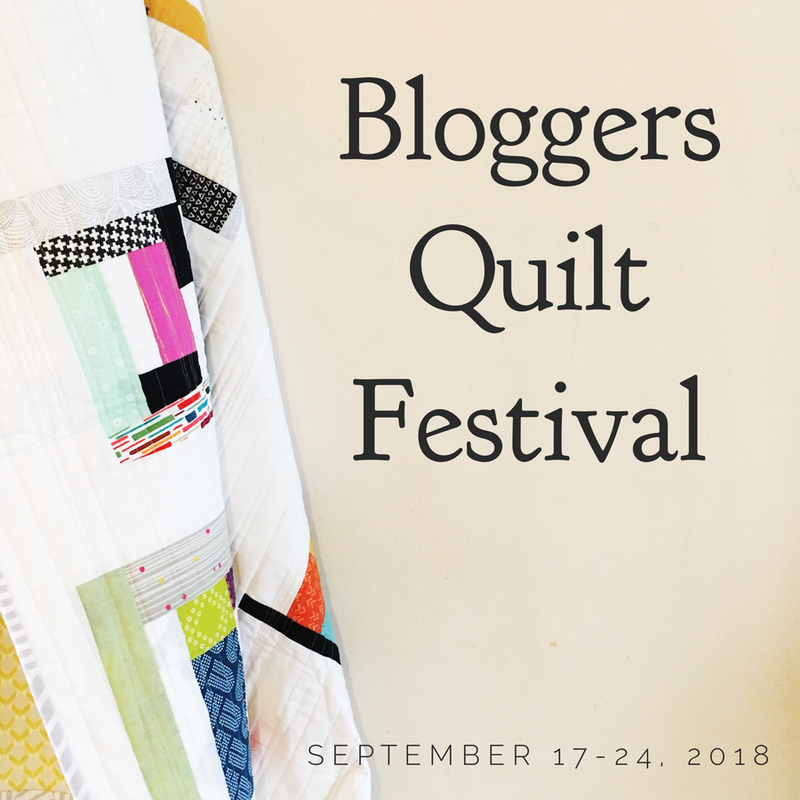 I’m so excited to be a part of my first blogger’s quilt festival! SO inspiring. Thanks for organising it. Blogger’s Quilt Festival is always such a pleasure – thanks so much to Amy and the sponsors for such a wonderful event!!! Thanks Amy for organising the Bloggers Quilt Festival!! It’s going to be a fun weekend!! Oh Amy, I always took forward to this time of the year. I find so many new blog friends, and see so much eye candy, that I dream of it until the next blog hop. Thanks so much for all your work. And thanks the the wonderful sponsors who have been very generous. You all rock!! Yay! It’s Quilt Festival time again!!! Thanks so much Amy for organizing this again. I look forward to this each spring and fall and always find so much inspiration and a ton of new blogs to follow. You rock! Thanks again Miz Amy. I’ve shared my miniature reproduction quilt on my art quilt blog. Congrats on your pinwheel dizzy quilt, I’m sure it will be a hit at Q. Market. thank you so much for hosting this festival AGAIN !! I love to see the wonderful quilts from all over the world – and I met so many great people during the last festivals I would never have met otherwise. Thank you !! Thanks again, Amy. I’ve shared my antique Bethlehem star on my antique quilt/ quilt appraising blog. Oh I am so excited to be here today!! This is my very first quilt festival to participate in. I have admired each one as you have so kindly hosted. :o) Thank you so much for the time and energy that you place into such special times like this! I can hardly wait to visit all the other participants!! YAY! love the quilt festival, thanks for hosting again! I’m bummed I didn’t get my quilt back from the quilter in time for this round. But I’ll certainly enjoy looking at everyone elses quiltS! Thanks for hosting, Amy! I’ve been looking forward to this one and will enjoy browsing through the posts! Hooray, it’s here! I love this festival Amy, you’re such a genius for dreaming it up! I hope everybody has fun! Thanks for hosting this festival! It’s so lovely to see all these amazing quilts in one place. Thanks for hosting this amazing festival once again, Amy! Looking forward to seeing all the wonderful quilts! Yay! I always look forward to seeing what everyone has made! Thanks for doing this, Amy! Thank you so much for hosting another Blogger’s Quilt Festival! This is such a fun event and I have made many new blog friends because of it…not to mention being inspired again and again. Linky worked perfectly. Thanks again! Thank you so much for hosting another Blogger’s Quilt Festival! This is such a fun event. Besides being wow-ed and inspired, I have made many new blog friends because of the Festival. Thanks again! Thanks, Amy, for hosting this. I always enjoy the quilts and quilters that i meet thru the festival. Great job. Thanks so much for hosting this again – I will need to go off grid for a few days to spend my time browsing all the fab quilts. Amy, thank you for once again hosting the Bloggers Quilt Festival. It is always a delight to visit quilters from all over the world. I’m looking forward to meeting up with old friends and making new ones. Thank you for this great opportunity. I will spend the week-end watching all the entries. Hugs. love this festival! so much inspiration at your fingertips! Thanks for doing this again. I love seeing all the entries; it is a goldmine of future quilt-making ideas. Thank you so much for all that you do for this community!! We love it so much! Thank you Amy for the opportunity to join in the show. It is really fun to see all the different work done by quilters, and gives some great inspiration fot the future. Thanks for hosting! I’m so excited to see all of the quilts!!! Another Blogger’s Quilt Festival, thank you Amy this is always so much fun. To see everyones quilts is a real treat and something to look forward to. Thanks for organizing another great Bloggers’ Festival! Thanks for organizing another great Bloggers’ Festival. Thank you Amy for doing this festival again ! Thank you sponsors for the great gifts ! I have not linked up yet ; ; haven’t decided what to share yet ! but will decide here real soon ! fun fun !! I’m soooooo… excited to see everyone’s quilts! The coffee is poured and sitting on its mugmat, I’m wrapped in one of my many quilts, and I’ve already started making the rounds! Thanks, Amy…your site is so lovely to join and so easy to navigate now. I love all of the ideas and the wonderful supporters who showcase their talents and products! Oh yea! It’s Blogger’s festival time again! I’m so excited. I’d really hoped to finish my red and white for this one but I didn’t so I’ll have to wait and post it in the next one! I’ll just post another one! Wow, once again some awesome inspiration and another lineup of great gifts from fabulous sponsors…Thanks, Amy! Thanks Amy for all your hard work with these festivals. I love looking at all of the amazing quilts that everyone makes (and finding yet more blogs to read!) I linked up! I LOVE the Bloggers’ Quilt Festival. There is so much talent out there, and so many beautiful quilts waiting to be discovered. Thank you so much for hosting this event. I’m going to love having a lazy Saturday to go and look at all the gorgeous quilts, read their stories, and find some interesting new blogs! Thanks so much for hosting this festival. I look forward to it every year! Can’t wait to be inspired! I’m a first timer and I’m loving it!! So much fun. I love seeing what everyone has been doing and am inspired by their genius. Thanks for hosting Amy. Thanks for doing this. I love seeing all the quilts. I am going to try to figure out how to do this linking up thing so i can share a quilt too. I have been waiting for this. Thanks so much!!! Another amazing event! So glad I was able to find something to link up! I’ve said it before and I’ll say it again – I’m glad to know you! I am so excited to be part of this virtual quilt show. It is a wonderful opportunity for all of us bloggers to show the quilts we make. thank you Amy for your extraordinary efforts to make this possible. oh wow! Looking forward to seeing & reading about all the lovely quilts and quilters! Thanks so much for hosting! Thanks for hosting! Looking forward to seeing all the quilts. I love the on-line quilting community. I love the sponsors you have participating. What a fantastic semiannual event. Thank you for having this. I just love to show off my quilts and to see what other quilters have done. Thank you for having this.I just love to show off my quilts and to see what other quilters have done. What a fabulous collection of quilts. I never cease to be amazed at how talented quilters can be. It is events like this that inspire quilters and non-quilters alike. This craft needs to be nurtured and maintained for future generations. Thank you for hosting this Amy. This is my first year to participate in the festival. It was easy and fun. Looking forward to visiting all the entries. Wow, Amy! I’ve just had way too much fun looking at all these amazing quilts! I want to spend hours seeing everything… but I have to work! :) Sadly, the pages don’t write themselves. I’ll stop by later in the day, though! Amy thanks for getting us all together so we can share these beautiful quilts. As always, I am looking forward to lots of quilty inspiration as i look at all of the festival entries. Thanks for hosting this wonderful display and for the chance at a great prize! Thank you Amy for hosting this wonderful event. I have a feeling I am going to be viewing some very inspiring quilts for the next week! Yeah, another quilt festival Very fun, thanks for putting it together. Thanks for hosting another amazing festival! So glad to be linking up again! Amy a big thank you for organising another bloggers quilt festival! I’m looking forward to looking at everyones creativity. Amy, a big thank you for organizing another bloggers quilt festival. I’m looking forward to looking at everyone’s creativity. I’m so excited to put my link up in the festival this year! I love this community of quilters so much. I can’t think of a better way to spend my day off today than looking at all these glorious quilts. Amy, Thank you thank you thank you for hosting again. I just love perusing everyone’s creations. Being the only quilter in my family and circle of friends…you get a little lonely!!!! Thanks so much for hosting this. I love seeing all the lovely quilts that are out there. Linked up and looking forward to marveling over all sorts of lovely quilts! Thanks for hosting this again, Amy. I love seeing all the lovely quilts people have created. My linky is up (#115). Thanks so much for doing this again! I loved it 2 years ago when I last participated & can’t wait to see all the lovely quilts again!!! I love your quilt festivals! So glad it is that time again! Thanks for hosting. I will spend many hours over the next few days admiring all the many different quilts. this is one of my favorite things to do! i find so many next blog buddies! and so many neat quilts!thanks for all your hard work! 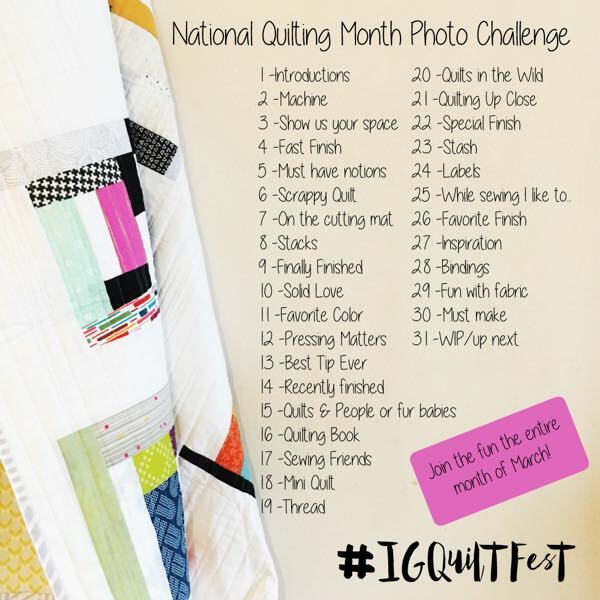 This is my first time participating in the blogging quilter’s festival and I love this idea! I enjoyed browsing through the links last year. And now I get to do it again. Thanks Amy for putting this fall festival together. I have been seeing all the lovely quilts on my blogging friends sites – just had to join in. Sharing my loved Raggedy Friends quilt. Oh, yes, I have already started browsing the entries. What a treat…..thanks Amy for hosting this fun event. Amy, thank you so much for hosting this Festival once again. There are some amazing quilts and stories, and I’m going to thoroughly enjoy visiting all the blogs over the next few days to check them all out. And a round of applause to your sponsors. Another successful Festival with a slew of wonderful prizes. Way to go everyone! This is my first time entering a quilt in the BQF — but I have really enjoyed touring around during past rounds of the festival. Thanks so much for hosting this — it is great fun, and very inspiring. Thanks, Amy, for hosting this fun event. It’s such a treat to browse to my heart’s content! Thanks for hosting!! I’m super excited (and nervous) to be joining in for the first time! I just posted a quilt for the Festival for the first time. Wahoo! Thanks for hosting this again, Amy! Can’t wait to look through everyone’s entries. I love the Blogger’s Quilt Festival. I guess I nearly missed it this year. I haven’t been paying close enough attention. Maybe I’ll go post something and link up. Either way, I definitely want a chance to win your lovely prizes! Thanks for hosting another Festival! I’m so Happy to Link up to the Blogger’s Quilt Festival. So many quilts to see! Thanks Amy for all your efforts. I am so glad to be able to take part again in the big Blogger’s Quilt Festival. Thanks for organising it again Amy. So many beautiful quilts to look at and thanks to the sponsors for the giveaways. Wow! All the great quilts so far, love looking at all of them. Thanks for hosting this event! Slow internet was not going to stop me linking today! Looking forward to seeing all the quilts. Hi Amy! Just added my link. Thanks so much for doing this again! Have a great weekend! I’m glad you are doing this again…it’s such fun to enter AND to see all the other entries! Thanks for all the time and effort you put into this. Thank you Amy for your generousity and heart to host this festival of quilting. It was your blog and this festival that inspired be to be brave, walk out of lurkdom and start my wee blog. Thank you for the opportunity to participate in your festval. Thanks for doing this again – I can’t wait to take the tour! I just added my link! It is the first time I have participated, and I am quite excited about being part of this wonderful event. Thank you, Amy, for organizing it. It is so inspirational to see all the quilts, read the stories and to discover new blogs. Just added my entry, linked above. Thanks for doing this another time, I have participated in a few of these now. Sure wish I could go to market! So happy to be able to participate again in the Bloggers’ Quit Festival! Thanks Amy. Love looking at everyone’s creations! Thank you for this wonderful online venue! I am participating for the first time! So much fun! Thanks for all your hard work Amy! So much fun and creativity in one place!! Thanks Amy (and all the sponsors, too)! This festival is always super fun and inspirational. This is always such a fun event! Thanks! Well, this slipped up on me! Don’t have a new finish so I’ll have to come up with an oldie. Thanks, Amy! This is my first time participating in this event! So many gorgeous quilts! Thanks for hosting! Thank you Amy and thanks sponsors for another chance to see so many lovely quilts. I enjoy this festival very much! Thank you for hosting the Bloggers Quilt Festival. I spend a lot of time visiting all the quilts on their blogs and always add a few to my favorites to visit often. Thank you for hosting the Bloggers Quilt Festival. It is always fun to visit the blogs to read about the quilts. I always add a few to my favoties to visit often. Thank you so much for hosting this amazing display of talent! I LOVE looking through all the quilts and reading the stories that go with them. Thanks for throwing this party again! I missed the spring but have just posted my most recent finish on my blog. Now off to see what everyone else has. Thank you once again Amy for hosting this wonderful event! This is my first chance to enter the Bloggers Quilt Festival as I just started my blog in September. I love the inspiration and creativity that this event is know for. Thanks for hosting. Thank you Amy for all the work you have done to organize this event! And thank you for the fantastic giveaway. So much inspiration! Can’t wait to dig in. :) Love bloggers quilt festival. Thanks for hosting and thanks to the sponsors for the great giveaways. Thank you so much for once again hosting this festival. I so enjoy seeing and reading about everyone’s lovely quilts. This is a fantastic idea – thank you so much – so many stories. I’ve posted mine too. Thank you to everyone who looks. Grazie Ami’s per l’opportunità di conoscere tanti blogger’s in tutto il mondo! gadds, I totally forgot to leave a comment earlier….but here I am, loving all the submissions this year! gadds I totally forgot to submit a comment! am loving all the quilts this year! Yay! I entered my quilt! Thanks for hosting this fun festival again! It’s the first time I’m join in this wonderful festival! Thank you Amy for this opportunity! Lots of hugs from Brazil! Thank you Amy, for this opportunity! Amy, I can’t tell you how much I look forward to this. Thank you so much. I’m comment again because I’m trying to backlink. I hope it works, now! Thank you so much Amy and thanks to the sponsors too! Thank you for hosting this festival. It is a great idea and a joy to be able to participate in something so grand. I love the BQF! Thank you! Love, love, love this time of year, Amy! Thank you for all you do to support the quilting community — we appreciate it! Wonderful idea! I linked up and linked back with your button and added your button to my sidebar and tweeted it too! Thanks for hosting! Thank you so much!! I just linked up with my Halloween Quilt! Your Quilt Fest a year ago was a huge revelation for me! I’ve been a fan ever since! Thanks (again)! Thank you for doing this! I just love looking through all the wonderful quilts and reading their stories… As a new quilter this is a treasure of ideas about colors and great patterns. thank you so much, what at great idea. So many beautiful quilts, thats amasing! I love this festival and just posted my entry for this time. Amy, thanks for the chance to enter a quilt. I very much enjoyed participating in the spring and loved the comments and traffic your show drove to my blog PLUS all the new quilt blogs I discovered. thanks for pulling this together. Thank you for pulling this together each time… it’s so incredible to see so many quilts at once and then run off to read more about them. Just loving it already!! Last year I was disappointed that I hadn’t participated, so this year, I’ve added an older quilt of mine. Next year I will plan something just for this! Thanks for hosting the quilt festival! Just add my stuff to the festival. What a cool idea! I added my quilt! Thanks so much for doing this twice a year, Amy! I can’t wait to browse though everyone’s blogs! Thank you for all the work that goes into putting this together! It is a highlight of my year! This is my first time participating! Thank you for putting this together. I love seeing all the great work that is out there! Amy, thanks once again for the festival! It’s such a great way to meet new friends and see what everyone is working on. Thank you so much for organizing this, Amy! Such great inspiration out there! I love the bloggers quilt festival! Thanks so much for putting this together! Thanks for organising this Amy! It is getting bigger and better each time! WOuldn’t miss it for anything! OK I can’t enter until after Halloween. I still have four costumes to make and it is Friday afternoon. I will be back on Monday way late, but I am coming back I promise. Each Bloggers’ Quilt Festival is more exciting and inspiring than the last. Good job, Amy, and many thanks! I’m so excited to be able to join the Bloggers’ Quilt Festival for the first time. Thanks so much for hosting it…so much fun! 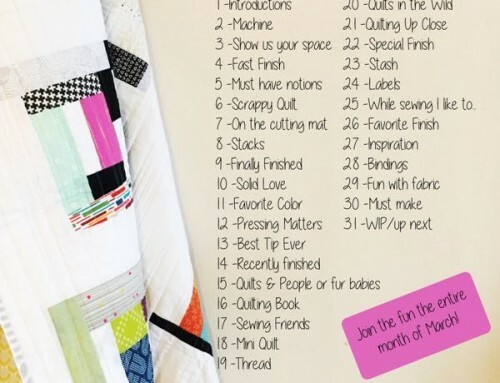 Thanks for organising this highlight of the quilting calendar! I hope I did all this correctly. Thanks for letting me join in. I have enjoyed seeing all the great quilts. I do love a good quilt festival. Amy, thanks once again for the festival! It’s such a great fun way to meet new friends and see what everyone is working on. Thanks so much for another opportunity to showcase our quilts! This is my 2nd submission and only my 3rd finished quilt ever! I love seeing all the creative and beautiful quilts. Lily. Thank you, Amy, for hosting us all again! I love this idea and am so excited to participate again. I always find new friends and fabulous blogs to follow as I visit each site. Thanks for hosting this wonderful virtual quilt show Amy! It is awesome to be able to see all these beautiful quilts from all over the world! What fun-great quilts and new friends. Love those dots! Thanks. Thanks Amy…it’s fun to be in this years Blogger festival..
Love seeing what everyone is creating. Thank you Amy for hosting the festival again! I look forward to having a chance to see what every has to share. Thank you Amy for hosting the bloggers quilt festival again. I look forward to seeing what everyone has to share. This is my first year participating! Thank you for hosting. It was fun writing up my post for this, forgot how much fun I had in creating the quilt I featured. WOW !! AMAZING WORKS !! Hi again Amy, I think I did it right this time..Thank you so much for again hosting this great fun way to share what everyone is creating..
Love all the eye candy.. Thanks Amy for hosting another fabulous festival! Thank you to your sponsors as well. I love the quilt festival and I’m so excited to be in it again! This is my first time to join in on this Quilt Festival though I have spent a lot of time looking at the entries in the past and have several favorites already for this one. Thanks for putting this together Amy it is so fun to see others work. Thanks for once again setting up the Bloggers Quilt Festival! I’ve just linked up mine and I’m looking forward to sitting by my computer with a cup of coffee over the weekend and browsing all the wonderful quilts. Thanks so much Amy for hosting another festival. They’re always an amazing source of inspiration. Thanks again Amy! It is so great that you take this on twice a year. I entered Bliss Between Friends. I’m off to visit the first group of entries. Thanks Amy! I’ve participated in all of the festivals that you have hosted and I love looking at all the creative juices of fellow quilters! Thank you for hosting this fabulous event. Thank you, Amy, for once again hosting a great Blogger’s Quilt Festival. Though I have no good reason to be starting any new projects, I’ve only been through a few entries and am already itching to start cutting into new fabrics and making more quilts. We’ll see how long the links keep me away from the sewing room! I am so excited to be able to partake in this. I plan on looking at as many of the others I can get to. Thank you for this opportunity. This was fun! Thanks for organizing it. This festival is so fun and inspiring! Prizes of course are fun too ;). Love seeing what everyone is working on and the story behind each labor of love. This is such fun! Thanks for hosting this, Amy! I’m headed off to see the other entries! Thanks for the chance to win, and a big thank you to all of the wonderful sponsors! What fun! Please add me to the quilt festival. I made a new post on my blog, linked up with Mr. Linky, joined the group on flickr, and posted pictures there as well. I’ve also linked to your page on my blog about my quilt and posted your button on my sidebar. So much fun seeing all these wonderful quilts. Makes October so much better. This is my first time joining in. I am so excited. I love the quilts everybody is posting. Thank you for getting us all together in one place! OMG great job Amy!! 212 entries already. I can’t wait to see them all! Thanks for the opportunity to participate in your Bloggers’ Quilt Festival! This is the first time I’ve done so. I enjoyed “a trip down memory lane” as I recalled the places I went and processes I experienced to create my “Snowflake Medallion” quilt. Sorry, I can’t tell you about a quilt I’ve never made. I a wantobe quilter. I wanted to get started on one, but with all the holidays and trying to make things for them. I won’t get time until after Christmas. Hope to get some done them. Love your blog. Also all the ideas and help you give us. Would love to be able to enter, but alas. I love seeing everyone’s quilts and blogs. Thanks. I love this time of year! Thank you for hosting us all again Amy, I’ve just blogged and linked! How FUN !!! This is the first time I’m joining in – thanks so much for hosting this and for all of the hard work that goes into it. I have published the story of my quilt. Thanks, Amy, for once again hosting this great event! I am always looking forward to it. Thanks Amy, for hosting another wonderful Quilt Festival!! They are always a lot of fun with so many gorgeous quilts entered!! Take care! Thanks for hosting this event! Thanks to the sponsers for sponsering! Thanks for hosting. I love seeing everyone’s quilts. Lots of talent out there! I love Blogger’s Quilt Festival! Thanks for doing this again. thanks for doing this once again Amy, plenty of quilts to look at for sure. I made this quilt for the local quilt show. IT is made from a kit but I found it quilte challenging. I couldn’t decide what motif to place in the center of the blank square. Some of the fabrics had circles on it so that meant pebbles would be ok to add. I love feathers and so I was set. I drafted the design, markded my top and I was off to the races. I think it turned out ok. I learned that problems can cause you to grow if you stop complaining and look at it from a different angle. Amy, thanks so much for hosting this great event again!!! Wow, this is exciting! Thanks for hosting! Thank you for hosting such a wonderful opportunity! I’m loving looking at all of the fabulous quilts! Thank you for hosting all this beautiful art!!!!!!! So many wonderful quilts that it will take me all year to get through this list! I am so happy to enter for the first time. Thank you Amy! Looking forward to seeing all the quilts. Yay! My doctor just put me on bed rest until my twins are born. I’m glad I will have something to occupy me for a few days. I plan to read each and every post! AND I just joined pinterest! Bring on the inspiration! Thank you for hosting this festival, it’s an exciting opportunity to view the work of others and to be inspired! Thank you for hosting the festival, what an exciting opportunity to display my work and to be inspired by others! I love Blogger’s Quilt Festival. I get introduced to alot of talented quilters & can start following their blogs. I recently stumbled upon your blog and was looking forward to seeing the quilts in the Quilt Festival. I’m at a loss for words. They are all so very beautiful and inspirational. Very well done to all who entered. Thank you so much for hosting this amazing and fun event – I`m off round the exhibit halls now to take in the beautiful creations and see what`s on sale. Living somewhere where there are no quilt shows, this means so much to me. Thanks again! I can’t believe I didn’t know about this before today! I just stumbled upon you, and decided to come play! I linked up my sister’s wedding quilt that I made back in May. This is like Christmas for yours truly! Thanks for hosting this! Thank you once again, Amy and all the sponsors for hosting such a great event. Thanks once again, Amy! Looks like another terrific festival! Thanks for hosting this yet another time. I look forward to seeing everyone’s handiwork and finding new blogs to follow! Wow, what a great collection of quilts! Thank Amy for organizing this, and Thank you to all the quilters that shared their wonderful quilts! I am looking forward to spending some time looking through all the quilts! Thanks Amy. this is so much fun… i sooo love the inspiration…..thanks again for organizing the bloggers festival Amy!!!! Yeah! I am super excited to be able to participate this year. I’m #265! Köszönöm hogy újra részese lehetek az őszi blogger fesztiválnak . Amy – I’m so glad you host this festival every year – it’s such a treat to have direct links to so many awesome quilts. THANK YOU! Amy I’m so glad you host this festival every year – it’s such a treat to have direct links to so many awesome quilts. THANK YOU! Thank you so much for hosting…so much beauty and creativity! I really need to tackle some Halloween sewing, but I just can’t stop looking at quilts! I love Blogger’s Quilt Festival! Thank you for hosting this! I love Bloggers’ Quilt Festival! I did not realize it was this weekend and was feeling kinda blue cuz I can’t be in Houston… this is the perfect pick-me-up and I so appreciate it and all the beautiful quilts that people are posting. I don’t have a blog, or you can be sure that I would be all over it! Thanks again for all of your efforts. What a great collection of spectacular quilts! Thanks for hosting it. Hi Amy! Thanks so much for the Bloggers Quilt Festival. 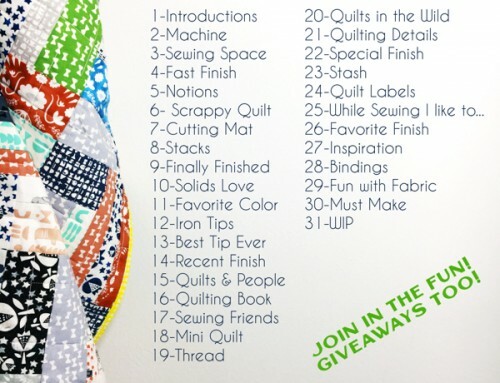 What a great idea to introduce oneself to the world of blogging quilters! Thanks for the giveaways, too!! Wow, what a wonderful collection of quilts to see. A quilt show in the comfort of our homes. What a great thing to see. Thanks for hosting this. Thank you for hosting the festival. Everyone has such great looking quilts! Thanks Amy for hosting another wonderful Blogger’s Quilt Festival! Thank you for hosting the fall festival again this year. It’s so much fun to look at all the quilts posted by everyone. Thank you for making this Quilt Festival possible. I love, love, love looking at the quilts. You’re such a dear for hosting this! You must be exhausted with this coming on the heels of the Sewing Summit! Thank you for giving us a place to gather and share and be inspired! This is my first time participating and I’m so excited! Looking forward to ‘meeting’ new quilting friends and adding to my list of ‘must make’ quilts! Thanks for hosting, again, Amy! I can’t wait to sit down and look at all the entries!! I love looking at all the fabulous quilts. Thanks for doing this. Thanks Amy! can’t wait till the kids are in bed tonight so that i can browse thru all these quilts!! I dont think my quilt would have gotten done without the incentive of this fun festival!! This is my first entry ever, and its been so exciting to be a part of! Thanks for hosting this! grrrr…not sure i posted my comment correctly, anyway, thanks! i plan to look thru all thse links tonight when kids are in bed!! Thanks for hosting again, Amy!! So great to see all of the fantastic inspirations here! I can’t believe I’m linking to the Blogger’s Quilt Festival (I’ve had my blog for only two weeks). So excited! Thanks to all the quilting blogging community that inspire and teaches me daily! What a fantastic show!!! Love it! Thanks for putting it on!! What an amazing amount of entries and super sponsors too. Have just posted my entry. Amy, thank you for hosting this festival again. It’s the first time I’ve had a finished quilt – well, one that I’ve done all the work on from start to finish – so I’m all linked up this time. I’m loving looking at all the other quilts and reading their stories. Hi Amy ! This is my first time participating in your BLOGGER”S QUILT FESTIVAL ! HOW FUN ! I have just posted my GOOD FORTUNE QUILT . I am looking forward to seeing all of the quilts ! Tickled pink to be participating in my first Bloggers’ Quilt Festival! Thanks for the opportunity and all the wonderful quilt inspiration! Hi Amy! Just got my blog post linked up. Thank you so much for all the hard work and time you put into doing this fabulous quilt show! I can’t wait to start cruisin’ through the quilts! SO excited to be a part of this! Thanks so much for generously hosting this wonderful Festival! I am having such a good time looking at all of these! Thank you! This is my first Blogger’s Quilt Festival. I’m so excited! So many great prizes!! Thanks for hosting the quilt festival and for the opportunity to be entered in the give aways. Yay blogger’s Quilt festival! It’s always so much fun! Thanks for hosting!! I’ve entered my quilt and I thank you for showcasing all these beautiful quilts. Thank you so much for sponsoring another quilt festival. I find it so much fun to find new quilters. I have become cyber-friends with several. Thanks for letting me enter the Fall festival. I started this quilt 2 years ago when I was inspired by the beautiful fall fabric from Moda by Sandy Gervais. In the mean time I moved and found it again a few weeks ago and knew I had to have it for my fall decorating. I quilted it on the long arm using a pantograph with leaves and swirls. Thanks for letting me share. what a great idea – thanks for organising this – it gave me another opportunity to show off!!! First time entrant into your festival. I LOVE this – so much talent and so many quilts. I made this with one of YOUR patterns and would have never thought you would see the end result. Who knew? Thanks Amy! You are so sweet to host this – I look forward to seeing all the wonderful work. Thanks so much!! Thanks for giving us this opportunity each spring and fall Amy. It’s so much fun seeing the work of talented quilters. Yay! Another wonderful bloggers quilt festival. It’s great to participate! Thanks! Thanks so much Amy for hosting this wonderful event once again!! This is my second time participating and I am really enjoying seeing others wonderful quilts!! Thank you so much for hosting this! This is my first Quilt Festival, I just finished my first quilt this September. I hope to have more quilts to share in the spring! Wow! So many quilts, so little time to look at them all. I guess I have 6 months to get through them all…until the next festival, right? I wasn’t going to enter this time, but I couldn’t help myself, lol – I love your Festivals so much! Thank you Amy! What a wonderful idea this is!! Thank you for the opportunity to see so many beautiful quilts! Thank you for hosting this!!! Its so fun to see all the fabulous quilts out there! Thanks so much for hosting this quilt festival! It’s a lot of fun! I really enjoy seeing all of the beautiful quilts in the Bloggers Quilt Festival and reading the stories behind them – just so inspiring!!! Look forward to checking out all of the quilts! Thanks for the display of beautiful quilts and the inspiration to share my own! Did I double comment? Thanks for the lovely display if this isn’t a repetition. I’m a newb, you can delete this otherwise. I love Blogger’s Quilt Festival!! Thank you for hosting it again Amy, can’t wait to get stuck in and read read read! Love your festivals. Thank you for hosting! Thanks again for hosting another quilt festival! It is a fun quilt show! Ahh… off to put on the kettle and enjoy a morning of eye candy! Thank you for hosting the festival! What a great place to come and view hundreds of beautiful quilts, it’s so inspiring and a great way to find more blogs! Thanks for hosting this festival-I love looking at all the amazing quilts people make. So much talent in one spot! Thanks for the opportunity to not only join in the Bloggers Festival but to see all these fabulous quilts that I might not have seen otherwise. Love it! Thanks so much for hosting the festival. I enjoy seeing all the other inspiring quilts and have added one of my own. Thank you for hosting again Amy! Love all the inspiration, wish I had more time to sew! Amy, thanks for hosting the Festival, this is going to be fun checking out all the fabulous quilters sites. Also a big thanks to the vendors for the fabulous giveaways. Thanks for hosting Amy! Such amazing inspiration here! Thank you so much for hosting the festival!!! How amazing, so many wonderful quilts to browse through and be inspired by. Thank you so much. Thanks for all your work in doing this festival! Thanks, Amy. I always look forward to this festival…and all the quilts! Time to start visiting the other blogs! Thanks for the opportunity to link to your post. 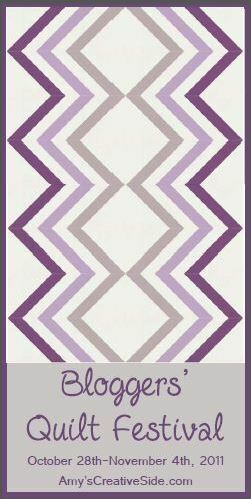 Its great to have a forum for any level of quilter. Thanks for hosting the festival once again…Fall wouldn’t be here without the Blogger’s Quilt Festival! Looks like a fantastic turnout! Love it! Thanks for hosting this amazing festival again!! I am looking forward to visiting everyone’s quilts!! Thank you Amy! The Festival is a joy for the eyes! Thanks again Amy, for putting on this wonderful quilt festival. Can’t wait to go through all the entries. Thanks again Amy, for putting on this wonderful festival. I can’t wait to go through all the entries. Thanks for the opportunity to see all these beautiful quilts…and to win! I love this event, this is my third year taking part, thanks for the opportunity! Whew, finished and entered. Now I just have to look at 300 quilts ahead of me, which actually sounds like fun. A quilt show from the comforts of home. Thanks for doing this again! It’s fun to see all the quilts – thanks for making it happen! Thank you for hosting the Festival and congratulations on the success of the Sewing Summit. Thanks once again for hosting this wonderful event! I only found it this spring, but have been inspired many times over and met lots of other quilty bloggers here. Thanks once again for hosting this wonderful event! I only discovered it last spring, but have been inspired many times over by everything I have seen here. 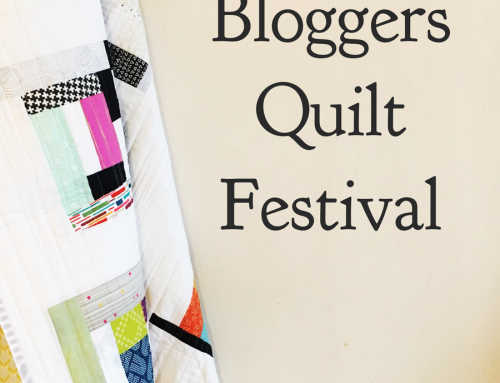 I have also met many other “quilty” bloggers through your festival. The array of quilts are oh-so-inspiring! I can literally spend hours gazing at them. thanks again for putting this together…again! very enjoyable & inspiring. I always love seeing all the quilts in the Bloggers’ Quilt Festival! Thanks, Amy! Hi Amy, I just joined the Festival. Love seeing everyone’s work. Thanks for hosting this! Soooo much fun! Hi Amy, I just joined the festival. Love seeing everyone’s quilts. Sooo much fun! Thanks for hosting this! Hooray, my first time joining in the Bloggers’ Quilt Festival! Thanks for hosting Amy! Amy, thank you for organising this amazing event!, I can’t stop looking at all these amazing quilts!. Amy, thank you for organizing this amazing event, all the quilts are fantastic! As always, you have another great fall show going on- I just put up my story and quilts – I hope you are having a great time viewing all the beautiful quilts. Thanks for hosting such a fun event. Thanks for doing this again, Amy. So much fun to see all these amazing quilts! I love seeing all the gorgeous fabric art being created all over the world. Thank you, Amy, and all the wonderful sponsores that make this happen. Thanks so much for hosting this great festival. It’s especially fun for all of us who aren’t at Houston- we still get our dose of great quilts. Thanks too to all the sponsors! Thank you for hosing this great festival again! I love seeing all of these amazing quilts!! Thank you so much for hosting this festival again! I love seeing so many wonderful quilts!! thanks for sharing! it’s amazing to see all these quilts! Thanks for hosting and organizing this great Quilt Festival. This is my third time, I’ve been quilting for just over two years. HMMM I haven’t entered yet but am enjoying looking at other’s entries. Maybe I’ll have to find one of my own to post….. Thanks so much for hosting such a fun event! I love looking at all the quilts. Every time I log in there are more to view. I appreciate all your hard work and efforts with this. Its so much fun and inspiring to see what everyone is working on. I’ve never seen so many beautiful quilts in one place before. They are all so beautiful, warm and wonderful!!!! Thanks for putting together the linky party – I enjoy seeing what everyone else is doing. Thank you so much for hosting again Amy! I always enjoy getting to see new quilts! Thank you so much for hosting this. With an (almost) 2 year old, it’s hard to steal time for a day out. Thank you for hosting the bloggers festival again. There are so many inspiring quilts and quilters out there its amazing! I just linked up my first quilt! Thank you Amy! Thank you for hosting such a fun event. What a treat to enjoy for several days! Thankyou so much for the opportunity to share! what a brilliant idea and a great way to find a whole new bunch of quilting ‘soul-sisters’! Hi Amy, Love your Festivals!! Wow what a great showing of quilts! I’m going to be busy on the computer this week. So much inspiration. Thanks for hosting this event Amy! Thanks for setting this up! :) So much inspiration! What a wonderful post of contributors you have here!! Awesome! I’ve entered my Summer Logs quilt. Don’t know if I did the link-in properly, but my photo does shoe up. Not my name though…? Do please enter me in your giveaways please. All these quilts are really fantastic! Thank you for hosting this. It’s so inspiring! What a bunch of great quilts! Lots of eye candy. I’m enjoying reading all the stories. Great event Amy. Phew! Finally made it again this year. Thanks Amy, so much fun! Thanks for hosting the festival again! I’m off to see those wonderful quilts!! I’ve linked up – the Festival is so much fun. Thanks so much Amy for hosting us all. It’s like a massive party all at your place! So many lovely quilts! I had in mind to visit each one – but with hundreds already and more being added – don’t think I’ll be able to. Thanks Amy! I finally managed to join with a quilt that I absolutely love! Yay! Thanks for hosting this, such a great place to check out amazing quilts! Thanks for hosting Amy, there are so many beautiful quilts and wonderful blogs for me to read. Thank you for organizing this! It’s my first time participating! Thank you for organizing this, it’s my first time participating! The quilts are beautiful and inspiring. Thanks for giving me the opportunity to link mine to such a creative group of quilters! The quilts are beautiful. Thanks for giving me the opportunity to add mine to such a creative and talented group of quilters. Thanks so much Amy for organizing such a great event. It’s always so fun to see all of the beautiful quilts in the festival! In the huge expanse of the Internet having events like these is great – as a new blogger it is so inspiring to see what others do – and how prolific so many people are – also to know that there are people as passionate about their hobby as I am. What a wonderful collection of quilts and stories!! Remarkable, and such a variety of patterns, colors – you truly bring the world together with this Festival! Thank you for hosting! Such a great way to spend hours…and hours…and hours! thanks for hosting Amy! What a wonderful collection of quilts and stories!! Remarkable, and such a variety of patterns and colors – you truly bring the world together with this Festival!! Thanks so much for hosting – I’ll be looking at it for weeks! Hi Amy! Thanks for pulling this festival together again, so fun! And your giveaways are wonderful. Hoping to get myself together and post a quilt before it’s too late. Fabulous event! It is a great quilt and I love the quilting you chose. Thank you for hosting the Quilt Festival. Thanks for putting this all together! Such a great event. Hoping to have my quilt up soon. Thanks for the great giveaways too. I entered my Moonlit Sky quilt! Thanks for introducing me to so many new quilts and quilters. Amy, Thank you for hosting the quilt festival. I receive so much inspiration from browsing and peeking at everyone’s quilts! Thanks for all of your hard work, Amy. Brilliant idea! I just added my linky. Please enter me in the drawings. I love it when you do these festivals! Amy: This is so much fun. What a wonderful show of quilt projects…a true feast for the eyes! (No calories, either! )So glad I could be a part of it! Oh, wow! I found your bloggers quilt show through my friend Jean who linked to it from her blog, and I’m having the best time looking at all the quilts! I don’t have a blog or a website, and haven’t quilted in a while, but this is going to help inspire me to get started again. Thanks! THANK YOU! I feel so heartened to think of all the creating that is going on! What a fabulous opportunity to share and peek at at other’s great work!!!!! Hmmm..one more try! THANK YOU!!!!! glad to join you again! i can’t wait to dig into the over 400 quilts i see!!! I stumbled across this festival and think it is a wonderful idea! I’m in. And I will continue to follow your blog. I love to see all the wonderful quilts! It´s the first time I entered a quilt here and I´m very excited! This is my first entry. What a great gathering of quilting talent! I’m having fun reading through all the entries. Thanks for hosting Amy!!! I love to share both the inspiration and the quilts. So excited to be participating again this year. I love the bloggers’ quilt festival. It’s so fun to read all the different stories and see the beautiful quilts. As always, thanks for hosting Amy! Thanks for the opportunity to show our quilts Amy! I love seeing everyone’s submissions. This is so inspirational! Love checking out all the quilts and blogs. Thanks for putting this together! A wonderful collection of styles. Thanks for hosting and motivating us to share! Flikr gallery idea is great. Another great festival. I’ve just checked out a few amazing quilts, looks like I’ll be camping in front of the computer for the week. Thanks for organising and hosting. Thanks for hosting I love this Festival and this time of year, it’s so surprising it’s already here! I just posted! Thanks for hosting this festival. I love the opportunity to share and to see other quilts in one spot! What a wonderful inspiring collection of quilts to look at! Thanks so much for organising this event for everyone Amy! WOW!! So many quilts and ALL in ONE place! So glad I had a quilt to share this year! Now, off to visit several quilters tonight! Thanks Amy for yet another fantastic festival!! Thank you once again for this event, there are always inspiring quilts to see and new bloggers to visit, love that. I love looking at everyone’s quilts! Thanks for hosting- such a great idea! Thanks for putting this together! Love all the quilts. What a wonderful way to share our work. Thank you, Amy, for putting this together. This is the first time I’ve participated and it definitely won’t be the last. Wonderful! What a wonderful way to share our work and be inspired by others! Thank you for hosting this, Amy! This is the first time that I’ve participated, but it won’t be the last. Wonderful! Once again a Great Show — I have been visiting a few sites each day — savoring a little at a time. Thank you so much for hosting this wonderful event. Thanks for organizing this again! And for the chance to win such great prizes! this is such a wonderful idea! such fun to see all the quilts. Hope I linked right this is a first for me. Wow! So many beautiful quilts. Thanks for putting this together, Amy. Thanks for organizing the festival. I am looking forward to seeing all the gorgeous quilts. This is so much fun…thank-you for doing it. Wow. Just found your blog – it’s a happening place for sure! Added my miniature quilt to the festival. I didn’t know how to number or title it. Did I skip something? Hey, it’s Blogger Quilt Festival time again! It’s my third time and I love to see all these incredible quilts. Hi! I posted my link and picture of finished quilt and new post. I could not figure out how to add your button, but put a pic there with the link. Hope that is ok. Thanks for the contest! Thanks so much for hosting this again! I look forward to it every year! This is a great event Amy and thank you for giving us all the opportunity to participate and also for leaving such good instructions for us to follow. Take care. Thanks for organizing it and for the chance to win some great prizes. These are always so much fun! Beautiful quilts and so much inspiration! Thanks for hosting this again, Amy. Yay! A quilt Festival I can participate in and view!!! Being so far away from the shows and festivals has been one of the more difficult aspects of living outside the US! I’m going to spend the next few days enjoying all the quilts posted. I am so looking forward to looking at at the quilts and reading the stories. One of the thing I miss the most living in South Africa, is quilt shows and festivals. So I will enjoy some coffee and lovely quilts over the next few days. Thanks AMY! What fun to cruise around the ‘net & check out all the fab quilts.Sort of compensates for not being at Houston Festival and no airfare or hotel expenses and we can shop our our jammies! Amazing Amy!!! I’m just getting ready to add my quilt to the linky! What a show! Hi Amy, thanks for organizing the Festival again. It is very nice that I can participate, and I also like a lot to visit all the bloggers who also join this event. Thanks. My first time to enter Amy’s Quilt Festival. I love looking at all the wonderful quilts!! Such expressions of love!! Oh man, I’ve looked through some amazing quilts so far! I’m hoping to get mine finished in time to enter by Friday. Off to the sewing machine! What a great party — thanks for hosting it! So great to see all the creativity. Thanks so much for hosting this fun event. I have discovered so many new and talented quilters here!!! Thanks for hosting this! I’m so excited to check out everyone else’s links! Thanks for hosting a FUN event! Thanks for hosting the Fall 2011 edition of Bloggers Quilt Festival. It been amazing to see this grow over the years, to see such amazing quilts and read such wonderful stories. Thanks for hosting the fall 2011 Bloggers Quilt Festival. it’s been great to see this show grow over the years and see such wonderful quilts and talented quilters. Thank you, Amy, for organizing this yet again. I so enjoy the inspiration of the stories and of the quilts. Too many quilts, too little time. But such a delight to play with fabric. Thank you so much for hosting this- it’s always so much fun to check out all the quilts and find new blogs to read! LOVE the BLOGGER’s QUILT FESTIVAL! Thanks for all of your hard work, Amy! And Thanks to the awesome sponsors too! Thanks so much for organising this Amy, it made me get my quilt photographed and on the blog!! Another great festival full of inspiration. Thanks Amy! So many wonderful quilts to look at. It’s like going to a Quilt Show in my PJ’s. Thanks. I’m so excited to join for the first time! I’m really excited to join for the first time!! Hi. Thanks so much for having an online festival! I posted my quilt a few days ago and then found your site. Perfect timing! Perfect timing! I just found your site after I posted my quilt a few days ago. Thanks for letting me join. I’m really enjoying all the quilts. What a great thing you are doing here. :) This is my second year and I can’t believe I almost missed it!!! How wonderful that you run this! This is my 3rd time in the festival, how awesome to see all the quilts…I will be ‘pinning’ a lot, I am sure! It’s been a couple years since I’ve participated in the quilt festival, but I’m excited to be back! This is my first time joining in with Amy’s Blogger’s Quilt Festival! I love this amazing Idea. Thank you for all of your kind work in it. I hope you’ll enjoy the new participants web sites :o). Thanks, Amy, for hosting this great festival! This is my first time entering and I am very excited!!! Thanks for hosting! It’s fun to see what everyone is up to and what their favorite projects have been! Just put my post up. Love the stories. Thanks Amy for hosting such a wonderful festival again. I love seeing all the quilts. It’s fun to get inspiration from all the talented quilters out there. Thanks to the sponsors as well. Thanks for hosting this great Bloggers Quilt Festival! It’s my very first entry and I’m amazed, wonderful quilts, so much creativity! Hooray! I love BQF – thank you, Amy! Thanks so much for hosting this incredible virtual show, Amy! It is such fun to see everyone’s lovely work! Thanks for the next QBF Amy! So many wonderful and inspiring quilts! I love the idea of this festival! It is so nice to see all the creative work you did, very inspirating. I always look so forward to the BQF – thanks, Amy! I may have to cancel all that I was going to do today… I sense there’s about 12 hours of blog surfing in my immediate future! PS, sorry for my duplicate submissions, and I hope I got it fixed. Thank you so much for hosting another bloggers’ quilt festival. I know it is a ton of work and I really appreciate all the inspiration and new discoveries that each time brings. I love Blogger’s Quilt Festival. It’s such a great place to get inspired and find new bloggers to follow. Thanks for hosting! Thanks for the opportunity to enter this fun event. So glad I made it in time! beautiful projects posted so far! Yay! I’m so excited that I have a quilt to enter! 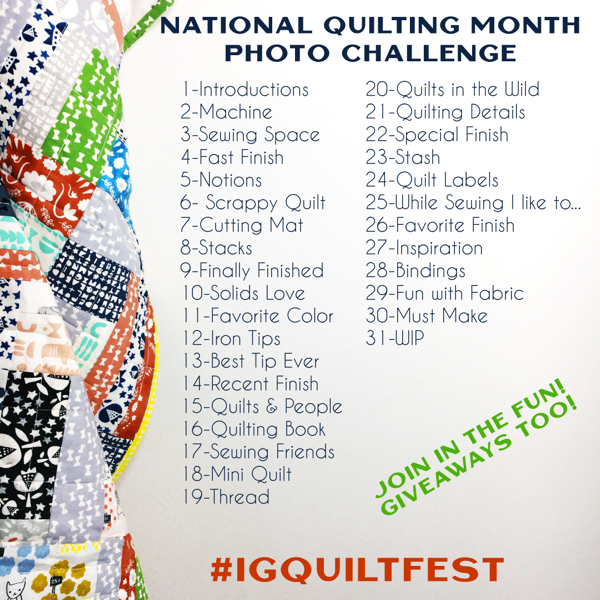 I loved looking at all the quilts last time you did this, and LOVE all the quilts that have already been entered this time! :) Thank you so much for hosting this! and for all the generous sponsors! This was so much fun! Thanks for hosting it!!! I love the quilt festival! It takes me several months to get through all of the linkies, but it’s fun to see everyone’s submission. Thanks Amy! I love the quilt festival! It takes me several months to get through all of the linkies, but it’s fun to see everyone’s submissions. Thanks Amy! PLLLEEAAAASSSEEE enter me to win some goodies! Thank you so much for hosting the Blogger’s Quilt Festival! I tried to comment earlier but I am pretty sure it didn’t come through. Thanks for this opportunity to join this quilt festival – so much fun to see everyone’s creations! Thanks so much for hosting such a fun event! Wow – over 500 quilts to look at! It’s my first time linking up, although I’ve enjoyed past shows as a viewer. Great idea! Thanks!! Amy ~ Thank you so much for hosting such a great event. I have really enjoyed looking at all of the beautiful entries!! I love the bloggers quilt festival! Thanks so much for doing this every year! Thanks so much for all your hard work putting together the quilt festival! It’s easily one of the coolest events in the online quilting community! Thanks for hosting this! It is such a wonderful way to find new blogs and get project ideas. Quilty high fives for everyone! Lots of awesome quilts here! The inspiration never ends! 524 quilts so far… WOW!!! That’s a lot of fabulous quilts! I love this Quilt Festival! There are sooooo many creative and amazing artists posting this fall! Wow! What an amazing group of artists! Love looking through all these links! I love to look at all the wonderful things you put on your blog. Thanks for hosting this Quilt Fest!! I love to look at all the wonderful things you present on your blog! And the Quilt Fest is so fun!! Thank you! Wow. So many beautiful quilts! Very inspiring. Thanks so much for hosting this again! It’s so much fun to participate and see all the beautiful quilts! Thank you so much for hosting this quilt festival, it’s spectacular! Thank you so much for hosting this quilt festival, it’s spectacular. OOHHH I LOVE reading these posts and am so thrilled to be participating this year! Thank you for the opportunity to talk about my favorite quilts!! I’ve linked up! Thanks Amy. WOW, I so love looking at and reading about all of these wonderful quilts. They are all so wonderful in their own way! Thank you Amy for making and organizing this amazing festival! This is my second entry and third festival during my blogging! I sit all the evenings (nights) visiting all those lovely quilting people and enjoying their fantastic works! Thank you Amy for organizing this fantastic quilt show! This my second entry and I’m so happy to join all those talented, lovely quilters! I finally got the computer working and got to enter the festival. Thank for doing this I love it. I’m a late entry to the festival, but I didn’t want to miss out on all the great quilts. thanks Amy for organizing this again. I’m joining in just under the wire. Thanks for hosting this festival, Amy! Great Festival. My entry is my Halloween Quilt on http://cissasblog.blogspot.com. Sharing on Fall 2011 Quilt Festival. Thank you. I love this festival, I just need to pull a blog post out of the hat! When does it close? thank you for hosting! it’s always so much fun and inspiration! Trial 2. I am having problems with the comment. I hope this will be published. Thanks for this great opportunity to see some fantastic quilts together. Thank you Amy. I’ve added my entry (rather late) and am now going to spend the evening looking at all the wonderful quilts that so many talented people have created. I showcase my monstersized Verry Berry quilt here. Thank you for organizing this. Not sure if my last comment was saved so I try again. I presented my monstersized ‘Verry Berry quilt’. Thank you very much organizing this. So happy to be joining in for the first time. This is a beautiful group of quilts! I have been back time and again viewing the festival. Love having all these ideas in one place. Thanks so much for coordinating the festival. Thanks for hosting the bloggers’ quilt festival. It is so much fun to look at all the great projects. I hope that I win one of the prizes. Wow, it will take me days to view all those great quilts! Fun fun fun! Thank you! Thanks for doing this it is a lot of fun! Just posted for my first Bloggers Quilt Festival post!!! Excited to look through other entries. Thanks for giving me the incentive to finish my first quilt. I’ve enjoyed the Spring festival and never expected to be taking part in this one! This looks wonderful. I haven’t seen an online quilt festival before but can’t wait to discover some new (to me) quilty blogs. My blog roll is in need of some more material. :) Thank you for hosting this. Thank you, Amy, for another great festival. thanks for the great quilt show…….. I never tire of looking at beautiful quilts! What a wonderful festival! The quilts are spectacular! I am trying to participate but not having any luck linking up. However, I will keep trying and keep promoting the festival on my blog…a little late to the party, but still having fun! Thanks so much for coordinating this again. I didn’t get to post a quilt this time but I love getting to look at all the others. I am so totally inspired by all these wonderful quilts AND links to the blogs of the creators. I’m off not, to get lost in quiltland. THANKS so much for hosting this! SO much quilting inspiration in one place! THANKS so much for hosting! It’s great finding so much quilting inspiration in one place! Today I finished my first quilt and added to the great line up of quilts here at the Festival. Thanks for taking time to organize this event! Whew! I made it. I just discovered Bloggers’ Quilt Festival the other day and feel like I’ve gone to heaven. All these brilliant blogs and quilts in one place! I am so glad I found you. Thanks a million. I am so glad I found you in time for Bloggers Quilt Fest! Thanks, for doing this, it’s been heaven having all these great blogs and quilts in one place. This is my first time entering the BQF. I’m glad to be a part of it! Thank you for hosting Blogger’s Quilt Festival once again! I love it!!! It so much fun! Just made it! Off to have a look at everyone else now. Thank’s for another great BQF. Just made it! Thanks for another great BQF. Sadly I don’t have a quilt to submit. I just learned the skill and I have been having fun quilting. I am motivated to make more especially with designs I have seen here today. I had fun visiting and thank you for the ideas. I’ve spent the spring and summer months dyeing more cloth than I’ll ever use and this place has reminded me of just what to do with it all. Thanks for this last minute opportunity! Big thanks for all you work setting this up. Thanks for hosting the festival again! So glad we finally got to meet in Houston. Take care. Thanks for hosting again! So great to meet you in Houston. What a wonderful festival. How great that so many quilters get an oppurtunity to share. And the quilts! Marveleous. This is awesome. I love seeing so many quilts in one place. This is my entry for the Bloggers Quilt Festival . I was so inspired by all the wonderful quilts on display, I know I’m going to have lots of fun reading over the next few days. I’m enjoying all the wonderful quilts. My first entry! Thanks for the chance to enter – there are some spectacular entries! Thank you so much Amy! I’ve enjoyed the festival since its inception! I think I forgot to add a comment…and I certainly want to be in the running for these great prizes! I’m taking my time and enjoying the show…it will take me at least a month to visit them all…something to look forward to everyday. Thanks so much for hosting this event. I’ve always wanted to participate in this festival! Here is my entry for the giveaway and check out my blog for my latest quilt. :) Thanks Amy for hosting this! So many beautiful quilts and so much inspiration! I love your Quilt Fest, and look forward to it every fall. Thanks for hosting yet again! I always enjoy blogger festival time! It’s great to see so many wonderful quilts. Amy, thanks for getting this together every market season. I find my best inspiration this way! thanks for hosting another one! i love all the scrumptious quilt viewing! I’m in :) Thank you for a chance at wonderful prizes. Thanks to everyone for sharing your talents. Enjoy <3! Thanks for the great festival! I finally joined the fun and added a quilt. There are so many wonderfully talented people out there! Thank you Amy! This is my very first time participating in this festival and I am thrilled to be part of it! The quilts are amazing here and I could spend all day at each person’s site reviewing their entries. In fact, that sounds like a good thing for tomorrow morning. Can’t wait to sit down and get inspired by each of you! Thanks!! Thank you so much for putting this great festival together! I look forward to it every six months. Nice job! Thank you for the opportunity to take part in this festival of incredible quilts. Many gifted quilters have contributed to your lovely blog. Broken Heart quilt that I pieced in a class about five years ago. I finished it right after I put my first dog down. Very appropriate name. Finally quilted it this year. i am so excited to have been a part of this falls festival…thanks so much for all the hard work you do hosting!!! Thanks for hosting Amy!! And great giveaways! Thank you for all your efforts! I look forward to hours spent visiting the links. This is my first entry as I’m a blogging newbie, but I am so excited! Thanks for all your hard work for putting this together, I really look forward to it and I know a lot of other people do too. It is so much and I am so excited to be able to participate this time! Thank you Amy for hosting this event again this Fall! I love visiting the sites and viewing the quilts. My entry is number 601. Take care! Got mine in! Thank you for hosting this! Love that you do this. It’s so great to see all the quilts. I love that you do this! Thanks for putting it together. I love seeing all the quilts. Thanks Amy~ glad I could participate this round. Thanks for doing this again!!! I just finished my quilt last night! just the perfect motivation. I’m so excited to participate in this round! Thanks Amy, for hosting such a fun and inspiring online event! Thanks so much for hosting this once again! I love it. The perfect motivation to finish up a quilt. (finished mine last night!) Thanks again for all the time spent organizing this festival. well, I nearly didn’t make the deadline! But I did manage to get the post put together, with some half-way decent photos :-) Thank you so much for putting this together for all of us, Amy! Thank you for hosting Amy! Thanks for hosting the festival again! I just finished my quilt up last night. Thanks for the motivation and all your time put into this. love it. Thanks so much for hosting this festival. Just the perfect motivation to finish my quilt last night! Thanks for another great round of the BQF! I love looking at all the wonderful quilts!!! Wish I’d seen this sooner, I would have joined in… the quilts are all beautiful. Thanks to all who shared their lovely work here. 618 quilts. Amazing work, too. I love them all. I am a new quilter and am so inspired by all of these quilts and all of you quilters. Thank you so much for sharing your inspiration with the rest of the world. You all rock!!! This has been so fun! Thanks Amy! Thanks for hosting again, Amy. This is always a lot of fun! I am slowly working through all of the entries. Very inspiring. Thank you. While I am fairly new to quilting and have much to learn, I appreciate so very much all if the talented quilters who willingly share their knowledge. This festival is terrific! I forgot to enter the giveaways when I did my entry…hope I am not too late! Mine is 565. Keep up the good work! Whoops forgot to enter the giveways….hope it’s not too late…my entry is 565…keep up the good work!